At over 100 pages, with eight strong case studies, the Masie Center has compiled an excellent overview of how learning leaders at major companies developed their learning strategies. Best of all, it’s FREE as “an open source eBook.” You can find it (and other great ebooks) here. We can learn a lot from each of these case studies, but — assuming you have limited time for reading — here’s a summary of the case studies so you can see if you want to spend time downloading it. A learning strategy develops the learning culture within the organization that helps make judgment calls that balance new and existing technology against what you can afford. “It is oriented toward action and requires visible outcomes” that are endorsed by the those who will oversee its implementation. And though it is “oriented toward action” it is *not* an action plan. A learning strategy is about innovation. “It calls for a deep look at what we do and how we can do it better.” (Or, in the case of our members, help them do things better. Here are the eight learning leaders and a quick summary of how they approached their organization’s learning strategy. While many of us might think a huge multi-national company like Shell can’t possibly give us any ideas for our learning strategies, they actually have an interesting two-prong strategy that’s worth some consideration. One part of their strategy “lists the key focus areas for learning in the short-, medium- and long-term. The second hinges on functional excellence or delivering learning in an efficient and effective way. They come together in the process of defining the key stakeholders and their required capabilities, working out the learning blend and then determining the most efficient and effective way of delivering learning interventions.” Whew! So how do they do this? “With part one, business results involved constant dialogue with all the managers from the global business. Part two emerges from a bi-annual benchmarking exercise using qualitative and quantitative data to identify best practices outside the company. This is based around identifying innovative processes, structure and governance, information systems, people and culture.” Simply put: work out what your members need to learn in one exercise, then conduct a best practices environmental scan to find out what you might be doing differently to deliver that education. How do you assemble your strategic planning team? Keith Dunbar at the Defense Intelligence Agency has some suggestions. Other critical lessons in strategic planning: ask the right questions so you can “understand the context in which the learning strategy has to operate” focusing not only on existing circumstances, but emerging issues; select learning strategy metrics that make sense (not just because the numbers are easy to get); sell the strategy in ways that eliminate barriers (his case study lists fourteen identified barriers). Bored by the entire idea of a learning strategy? Can’t get past thinking of it as sort of two-dimensional when you’d prefer a 3-D option? How about this one: Eaton, a global power management company, uses a “strategic learning portfolio” (SLP) which “represents a wide variety of learning opportunities to improve business performance through a continuous and multidimensional process, including both formal and informal routes to competence. The SLP is set at three levels: instruction (for novices, mostly and 20% of output), ideas and collaboration (needed mostly by competent performers, and 60% of output) and innovation (mostly needed by experts, and 20% of output). Each of these areas is divided into informal and formal learning.” For more about how Eaton accomplishes this, see the chapter, “Making a Strategic Learning Portfolio the Heart of any Learning Strategy,” by Terry M. Farmer and Evan Ishida of Eaton Corporation. Though aLearing doesn’t advocate developing a strategy based on technology, sometimes that’s the only place an organization can start. Mike Cuffe describes how Farmers Insurance leverages its technology and corporate “university” to develop “multimedia ‘learning nuggets’ which can be accessed at any time,” based on the organization’s philosophy to “enable rather than constrain.” Flexibility and speed of program initiation is critical so they can effectively deliver a fast message to a lot of people in emergencies like natural disasters. Finally, if selling your education committee or association leadership on having a learning strategy at all is a hurdle, take a look at what Lloyds Bank in the United Kingdom is doing. Peter Hallard “passionately defends the need for a learning strategy” but also says that “learning leaders who devote their time to the development of detailed learning strategies are destined to a lifetime of disappointment.” That might sound like a contradiction, but a focus on “process” rather than “plan” is the key. The organization’s learning leaders need to be experts in the business, “expert and confident enough to interpret business issues and postulate a learning solution” so “something innovative and comprehensive in scope that works quickly” can be developed. Lots of food for thought there. If you’re looking for some alternatives to standard strategic planning methodologies, the Masie Center ebook has them. if you’ve got a strategy or not, and why. if your education budget will be higher next year or not. what sorts of elearning your organization is offering and how often. the biggest change your education department in anticipating in the next year. Remember — whether you have a strategy or not, whether you offer elearning or not — your voice is valuable and lends insight into your situation. Ten quick questions. Five minutes max. All responses are confidential. No registration to participate is required. If you’re curious about the four key elements of training within the Central Intelligence Agency, for example, this is your resource. By the way — those four elements would make strong pillars for supporting any organization! At 148 pages, this is an excellent resource for an unbeatable price! To narrow your reading focus, Nigel Paine’s introduction highlighting some of the articles is a great place to start. 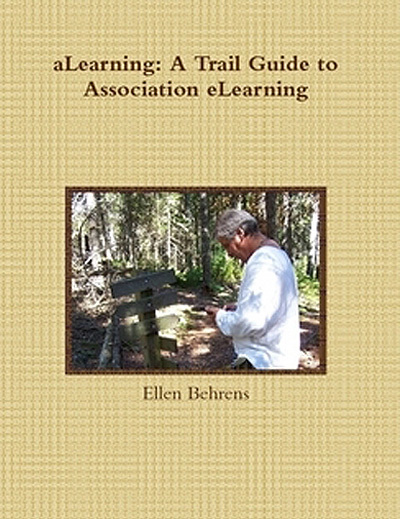 Though the focus of the book isn’t on association learning, you’ll find in its range of voices and experiences plenty of examples and expert perspectives that can inform your justification for learning or elearning initiatives — not to mention get revved up to try something or feel reassured that something that didn’t go very well for your non-profit didn’t go very well for a major corporation, too. Many thanks to the MASIE Center for providing this great book!